Imagine a new generation of large-scale applications fully leveraging the underlying power of the Future Internet. Chances are these applications connecting hundreds of millions of services, devices and systems will be made possible by the CHOReOS Integrated Development and Runtime Environment and its service choreography approach. Check out the video, it explains what's at stake, how it works and shows how it applies to your every day life. "Worldwide shipments of smart connected devices will surpass 2.2 billion units in 2017. As the cost, size and power requirements keep decreasing, computing will be embedded in all kinds of products and everything that can benefit from the Internet will be connected. Not just stationary computers and laptops, but also tablets, smartphones cars, game consoles, TV sets, cameras, machines, lights and home appliances, even your coffee maker." Run the video to discover the rest of the story! Aligned with the Future Internet European initiative, FISSi is an outcome of the CHOReOS project. Designed to support emerging technologies in the next stage of distributed applications where FISSi is of interest for most stakeholders in the Future Internet. This opens up a vast perspective for many different interested parties. In this context, CHOReOS is set to enable a new wave of innovative applications in many sectors of the economy”. For more information on FISSi, please visit OW2 FISSi webpage or download the FISSi General Presentation. 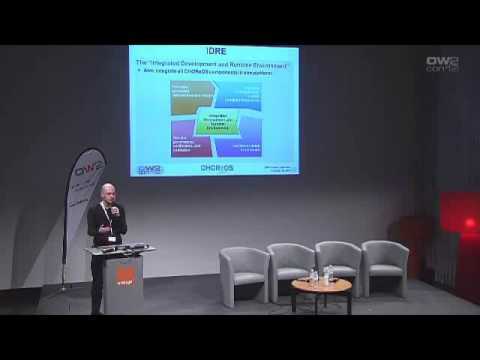 See CHOReOS presentation by Pierre Chatel, Thales, during OW2con'12 Project Spotlight Session. Large Scale Choreographies for Futur Internet with CHOReOS: from theory to practice. CHOReOS is an OW2 project since November 2012. Latest addition to the online demos: DynaRoute in action, the scenario is being performed in Thessaloniki, Greece, where a tourist uses his smartphone to organize his last day of vacation in the city. click here. Still online, feel free to drill-down the most recent M24 project demos and discover the secrets inside CHOReOS. CHOReOS revisits the concept of choreography-centric service-oriented systems to introduce a dynamic development process and associated methods, tools, and middleware. This IDRE (Integrated Development and Runtime Environment) is designed to build robust software systems that implement and coordinate the services in the Ultra Large Scale Future Internet. Interview with George Veranis, R&D Department of MLS, Thessaloniki, Greece. As a result of their contributions to CHOReOS work package 2, Alfredo Goldman and Yanik Ngoko won the prize for the best paper presented in the 9th IEEE International Conference on Service Computing. You can read about the award and consult their prize-winning paper here. After three years of intense R&D activity, over a dozen meetings, thousands of mails and 6400 lines of code, the CHOReOS project has completed its final revue on November 6, 2013, in Brussels. But CHOReOS was also a great personal experience for many of the participants. Share the experience, check out the CHOReOS photo album.